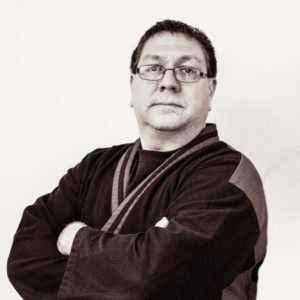 Tom Brown, a 1st degree Black Belt has been studying Soryu karate under Master Jeff Bonugli since 1997. He started it as a hobby with his then girl friend (now wife). Tom loves teaching self-defense and always has a unique method of getting his point across. Tom traveled and competed in many tournaments with his wife, winning many titles himself. Tom has been instrumental in the formation and development of The United States Soryu Karate Federation to which AFK proudly belongs to. He is now the proud father of 2 little girls and is an awesome father. Tom earned his Bleck Belt October 2014. In addition to karate, Tom is also an avid outdoorsman and entrepreneur. 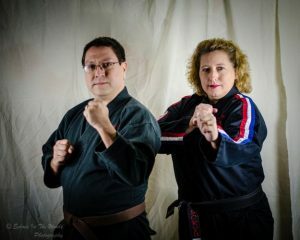 Sensei Shawnie Brown, a 5th Degree Black Belt, started Soryu Karate training in 1996 with Master Jeff Bonugli. In 1998 as a purple belt, Mrs. Brown won the Black Belt continuous sparring division at Houston’s Karate Olympics. By the end of 1998, she was ranked the #1 Black Belt fighter in Texas, #3 in Mexico and #5 in the U.S.A. Her dominance of Texas continued for 2 years until, in February 2000, she became pregnant with her first child. She continued to teach and train during this period. She also opened Alamo Family Karate in San Antonio on January 3rd, 2001. Sensei Brown received her 1st Dan Black Belt in February 2002 with her husband and baby girl watching and cheering her on. Most of her original students still train to this day. In November of 2003 Sensei & her husband, Tom, had another daughter and again she taught and trained throughout the pregnancy. She received her 5th Dan Black Belt July 10,2017. Sensei Brown has a passion for teaching women, children, and teens karate, self-defense, leadership, integrity and self-confidence. She taught in San Antonio, Texas until June 2007 when she and her family moved to upstate New York to open American Family Karate. Sensei Brown is very thankful to Master Bonugli for his instruction and support through the years. In addition to karate, Sensei Brown plays bass guitar, acoustic & electric guitar, and sings in two bands.